The following list of sovereigns is for coins in stock as at our last update of this page. It is best to check availability before ordering or give alternatives. 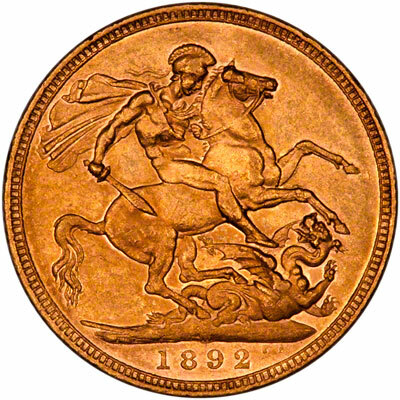 Sovereigns were issued for Queen Victoria in almost every year from 1838 to 1901. There were three main obverse (head) designs, and two reverse designs. 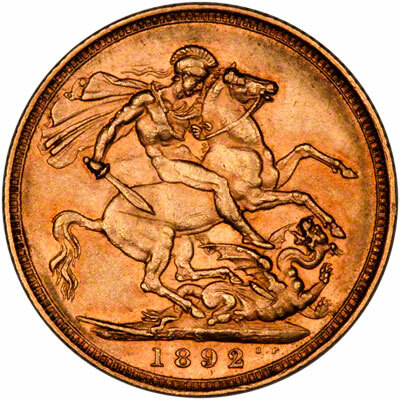 The jubilee head was produced from 1887 to 1893 inclusive. 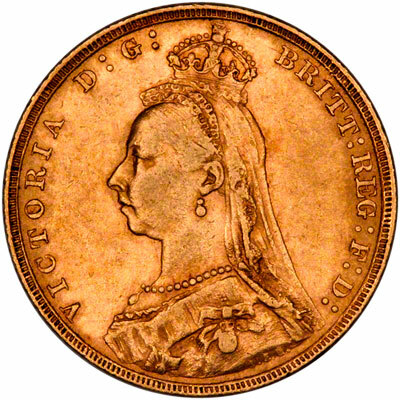 All Victoria Jubilee Head sovereigns from 1887 to 1893 share the same obverse (head) design. 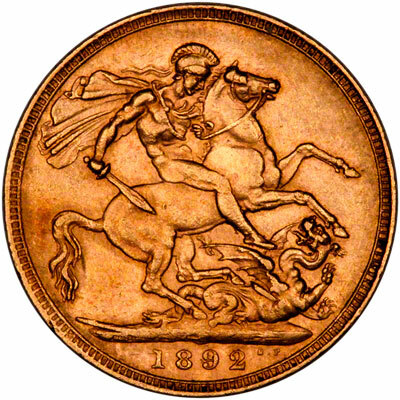 The reverse is the familiar St. George & Dragon design originally engraved by Benedetto Pistrucci about 1817. In 1892, The Royal Mint in London, and the Australian mints in Melbourne and Sydney, all issued sovereigns. 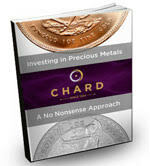 You can visit our Mints & Mintmarks page for further information. As with many older sovereigns, availability can be quite variable, particularly in better condition. Often we come across small batches of sovereigns, all of a particular date and mintmark, so that we have an abundant supply while stocks last, then we may not see another similar batch for years. The following list of sovereigns is for coins in stock as at our last update of this page. It is best to check prices and availability before ordering or give alternatives. The US $ prices in the this table may be out of date due to currency fluctuations.